Have partnered together in an effort to bring our state of the art Personal Tactical Shooting simulator to the citizens of Sparks, NV. 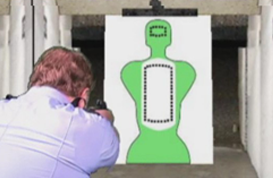 This simulator is an immersive shooting aid that facilitates and enhances the human brain in properly developing the needed mindset, skills and tactics to react to a dynamic critical incident (lethal criminal-deadly attack). Our simulator helps develop fundamental shooting skills, judgemental skills (shoot, no shoot), reactive skills, threat detection and threat identification. Below are screen shots of the Skill Builder Drills and Course of Fire. 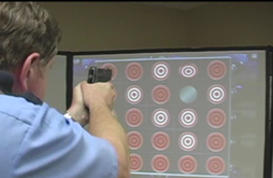 Beginning February, 1st, 2012, the tactical shooting simulator will be available for training on a daily basis at our Sparks business location. Simulator rates are listed below. In addition to our Sparks location we can also come to your location for on site training. Our Sparks location is also available for company, bachelor and birthday parties. In addition to our Personal Tactical Shooting Simulator; we are also introducing a new training program using the very high tech state of the art SIRT Training Guns (see information below). While NLT knows that dry fire training is no substitute for live fire training, neither is there a need to rely on it exclusively thanks to the Shot Indicating Resetting Trigger (SIRT) Training Pistol and the exclusive laser feedback mechanism. Designed to complement, not replace, live fire training, the SIRT Dry Fire Training Pistol brings together a host of patent pending technologies critical to improving shooting accuracy while addressing issues of cost and liability. Safe, effective, and innovative, the SIRT Dry Fire Training Pistol was developed by shooters for shooters. We understand the unique training demands and restrictions faced by today’s law enforcement professionals. Built tough with sturdy steel construction, the SIRT Dry Fire Training Pistol looks and feels like the real thing by matching the size, weight, and center of gravity of the officer’s live fire pistol. In addition, the SIRT Dry Fire Training Pistol even offers a host of customizable features including mag cartridge changes and replaceable sights. Unlike a standard live fire or Air Soft pistol, the SIRT Dry Fire Training Pistol provides instantaneous performance feedback and no need for ongoing expenditures such as ammo and targets through laser feedback. Because of its flexibility and cost-effectiveness, the SIRT doesn’t just permit additional training — it encourages it. Simple to use, the SIRT Dry Fire Training Pistol is applicable to a range of training exercises including shooting accuracy, sidearm handling, integrated cardio and live course programs, and even force-on-force training scenarios. Because it does not discharge any type of projectile and instead uses laser feedback, the SIRT Dry Fire Training Pistol can be used safely in nearly every environment and situation.